That Special Touch...Cakes that are Beautiful And Delicious...The Best! 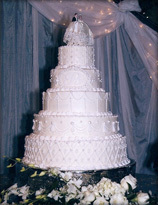 Since 1982, That Special Touch has been providing Central Mississippi with the most delicious, beautiful, and unique cakes around. Our cakes are made fresh and known to be incredibly moist. 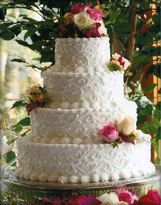 The traditional White Cake and the Italian Cream Cake are our most popular but there are many other flavors available. Each of our wedding and groom's cakes are personally decorated by the owner, Richard Bailey, who pays special attention to your specific requests. Call us today to order your cake or to set an appointment to select your wedding and groom's cake, and don't forget to ask about samples! It will be the most delicious decision you will ever make! Besides the bride, flowers are one of the most photographed details of a wedding. 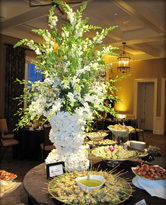 It's important that the bouquets and centerpieces fit perfectly with the style of your wedding. We take special care to make sure your wedding flowers are exactly what you're looking for to make your day special. William will meet with you to plan church and reception site decorations (on site, if that is more convenient for you) as well as the bouquets, boutonnieres, and corsages. 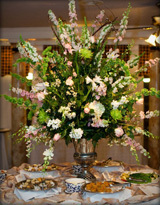 William personally makes and designs all the flower bouquets and arrangements to insure they are exactly what you want. For a truly unique and beautiful floral choice for your wedding, reception or party, call for an appointment. 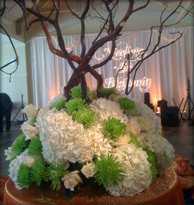 William Box Designs...Floral Designs You in Mind.